She said the four crew on board Flight KKE 4854 were taken to hospital with what she believed to be minor injuries. 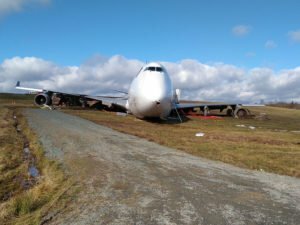 The plane was sitting on a slight incline far off the runway and within about 50 metres from a fence that marks the perimeter of the airport boundary. Two of its engines appeared to be attached but were heavily damaged, while two other engines appeared to be sheared off completely. Mangled debris was scattered behind the plane. The airport activated its emergency operations centre and suspended all flights, but the main runway was reopened by 8 a.m.
She said there are delays in arrivals and departures. Several fire trucks and RCMP vehicles were surrounding the plane on what was a warm, misty day. It appeared that the plane had been sprayed with foam by one of the fire trucks, but there was no apparent sign of a fire. An aluminum ladder trailed from a main door near the front of the aircraft that was open. The airport said it handled 34,051 tonnes of cargo in 2017. On Oct. 14, 2004, a British-based MK Airlines 747 went down just beyond the runway during takeoff, killing seven crew members. The Boeing aircraft dragged its tail before breaking up and bursting into flames in a wooded area. No one survived.